With advances in technology and CAD/CAM (Computer Aided Design/Computer Aided Manufacturing), it is possible to make porcelain crowns and veneers in about an hour. The instrument is called CEREC, a synonym for Ceramic Reconstruction. Dr. Drahota is the area’s most experienced CEREC dentist having restored over 5000 teeth using this technology. 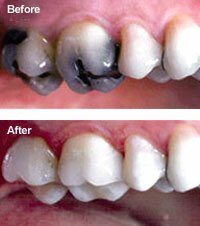 CEREC allows more of the healthy tooth to be salvaged, has shades to match existing teeth and is metal free!. Another benefit of CEREC is impressions are a thing of the past. Because the restoration is done in the same appointment, there isn’t the need to wear temporaries for two weeks, eliminating an entire second appointment. Get healthier teeth and your new look in one appointment!